Scarlet is one of the most magnificent bouquets you can buy. It is made with only one thing in mind - the best of the best! 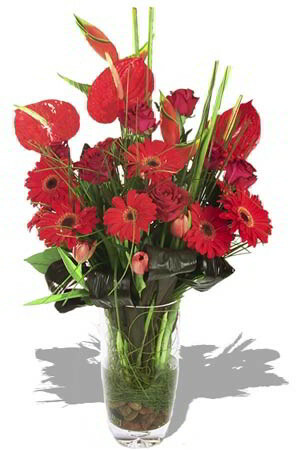 Stunning long stemmed red Roses, stylish red Tulips, lush red Helliconia, modern Anthuriums and fancy red Gerberas interspersed with glossy Tropical Foliage and Spear Grass work together to emanate extravagance. Send Scarlet today to someone you would like to impress or thank profusely.Vase not included however; we recommend adding a stunning Superior Vase to make a seriously good impression. Delivered with a smile, and beautiful flowers- my son's girlfriend was delighted. Very easy to order and received wonderful personal service on delivery. Thank you. my mom was really happy as she received the flowers.it arrived on time and the flowers was really nice.thanks for making my mom happy on her birthday.i will definitely order from you again. U guys did a good job . the flowers were just perfect,,,and the delivery was very prompt and on the date I wanted,,,thanks so much! Flowers were received right away..and they were very pleased. Will call you again for sure on our next need.